Rent a luxury car rental with Sixt in Barcelona for an unforgettable rental experience in this remarkable beachfront metropolis. Tour the major sites from architectural pioneer Antoni Gaudi, park up and explore renowned art institutions like Museu Picasso, Fundació Joan Miró and the Barcelona Museum of Contemporary Art. With a Sixt luxury car rental you can enjoy Barcelona’s extraordinary architecture with the top down in a convertible or in a speedy and responsive sports car, or for more space try the elevated views of a sturdy and robust SUV. On average our premium vehicles are only 3 months old, putting you behind the wheel of a brand new luxury car rental with all the latest features. Drive with the top down and relish the warm Catalan wind in your hair. Barcelona is a fantastic city to explore in an exotic car rental, cruise down to the Nova Icaria Beach or take a trip further afield to the north where you will find Ocata Beach, known for its tranquility and fantastic sunsets. Rent a convertible with Sixt for spacious seating along with inbuilt infotainment and driver assist systems. Many of our convertibles and sports car rentals also have back seats for extra passengers and our SUVs give you a luxurious amount of space for more passengers, shopping and lots of luggage. At Sixt, we subject our vehicles to rigorous safety checks so that you can feel confident in your vehicle. 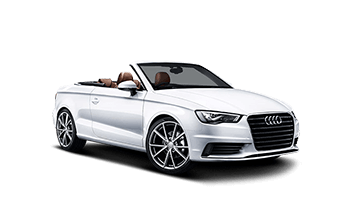 Our convertible rentals in Barcelona are equipped with safety features like rollover pop-up bars and extra airbags while our SUVs are sturdy on all types of terrain and some of the safest vehicles on the road. Renting a luxury car in Barcelona is simple with our fast and efficient online booking process. When you reserve online you can tailor your exotic car rental with excellent optional add-ons like GPS navigation systems and additional drivers, enhancing your luxury car rental experience. We also offer a range of extra protection options for added security and peace of mind. Our flexible rental periods are perfect for all kinds of vacation, whether you're doing a quick city tour of Barcelona or a long distance road trip in Catalonia and beyond. With the Sixt one-way rental option, you can conveniently drop your premium vehicle off at a different Sixt branch, broadening your vacation possibilities in Spain.